North Korea has sent a letter of protest to UN Secretary-General Ban Ki-moon about a Hollywood comedy about an assassination attempt on North Korean leader Kim Jong-un, according to Voice of America on Wednesday. In the letter to Ban dated June 27, North Korean Ambassador to the UN Ja Song-nam argues that film "The Interview" is an insult to Kim. The fact that the U.S. allowed such film to be made is "the most undisguised sponsoring of terrorism as well as a war action," he added. He insisted the U.S. must bear the full responsibility for sponsoring and supporting terrorism. 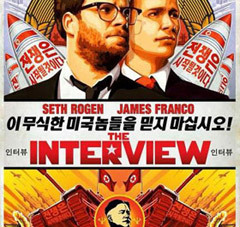 Produced by Columbia Pictures, the film revolves around an American TV talk show host who visits Pyongyang for an exclusive interview with Kim and is tasked by the ICA to assassinate him. It stars James Franco and Seth Rogan and is slated for release in the U.S. in October. When a trailer for the film was released late last month, the North Korean Foreign Ministry issued a statement threatening a "resolute and merciless response" if it is released. The statement was attached to Ja's letter. He requested Ban to circulate the letter and statement at the UN General Assembly and Security Council meetings.